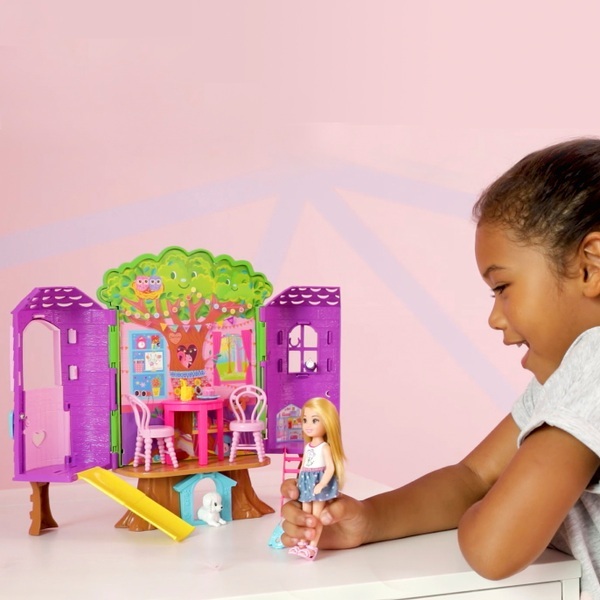 Chelsea doll and her puppy are ready to host friends in their ultra- cool tree house. Set amongst the branches and leaves of a colourful background, there is a swing outside where Chelsea doll can get some sun. Open the front doors to reveal the inside of the tree house. There’s so much to do! Take the ladder that flips down up into the playroom where there is a window for stargazing. In the centre, a dressing room has a vanity that flips to reveal dress-up masks, and a dining space holds the table and chair and is a perfect spot to munch on some cupcakes. The other side holds a slide that flips down for a fun ride. Chelsea doll is ready to hang out all day in a casual outfit and shoes.